1Put the carrot, red pepper, onion and garlic in a food processor and pulse until chunky (not quite pureed). 2Transfer the vegetables to a large bowl and add the ground beef. 3Add the bread crumbs, salt, cumin, cayenne pepper and egg to the bowl and combine all ingredients thoroughly with the meat. Your hands are your best tools for this so roll up your sleeves and get dirty! 4Form the meatloaf into some kind of shape that fits onto the plank. I used a large Tupperware container for mine, but go crazy. A thinner meatloaf will cook quickly. A thicker meatloaf will take longer to cook and develop a nice crust on the outside while the inside is very juicy. 6The plank will soak up most of the drippings from the meatloaf, but it is still good to stick a drip pan under the cool side of the grill to catch any left over grease. 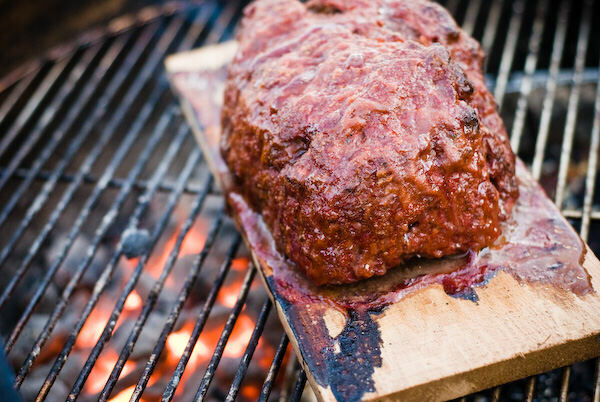 7Transfer your plank with the meatloaf onto the cool side of the grill and close the lid. 8Combine all of the glaze ingredients in a bowl. 9After the meatloaf has been grilling for around 30 minutes, brush all sides with the glaze and then close the lid again. 10Now sit back and relax and wait until a meat thermometer in the center of the meatloaf hits 150 degrees. Don't peak on the meatloaf too much or you will loose a lot of heat. Mine took around an hour and a half at 350 degrees, but it all depends on the shape of your meatloaf. Obviously, we want to cook for temperature and not time. 11When the meatloaf has cooked through, use a large spatula to transfer the plank of delicious meatloaf to a large platter and allow the meatloaf to rest for about 10 minutes before carving. 12Slice large slices and serve on the platter! Gonna try this. Great idea!! !